For those that don't know, my name is Matthew Knapp, and I'm a Bigfoot researcher from Oklahoma. I've had a life-long interest in the subject, and joined the research community in late 1999/early 2000. In 2001 I started actively going into the field, and in September 2002 I was fortunate enough to have my first official sighting during a group outing. Over the years I've had several more sightings, various encounters with what I believe were Sasquatch, found numerous tracks, formations, hand prints, had rocks thrown at me, heard vocalizations of all types, experienced tree knocks, and have had a few experiences that I just can't quite explain. I've had the pleasure of meeting and getting to know various individuals within the community, some good, some bad, and some I have grown to consider family. I've collaborated and discussed the subject with some of the most well known and respected researchers in the field, as well as people who's names you will probably never hear let alone recognize. As I said, I've had a life-long interest in the subject. My reason for joining the hunt was a simple one. I wanted to know for myself if Bigfoot was real or not. There were plenty of stories and reported sightings out there, and I had met people who seemed totally believable tell me they had seen them, but that was never good enough for me. I've always been the type to find things out for myself, and when it came to Bigfoot it was no different. I didn't like being in the position of not really knowing for certain if there was something unknown roaming the woods or not. The same held true for the various methods of seeking them out, or different aspects of their behavior that I would be told by others. Even if it were people I completely trusted, without the first hand experience there remained that question mark in my mind. Once the question of their existence had been answered, I found myself at the unfortunate threshold so many others have reached. A limitless amount of questions with virtually no answers. A mystery that I had no chance of simply walking away from. I have been working on the riddle of the Sasquatch for over a decade. There are many others who have been working on it much longer than I have, and possibly ever will. The amount of time, energy, thought, miles traveled, finances, etc. that have been put into this mystery by people such as myself is an incalculable number. Bigfoot has become part of my everyday life. As ridiculous as it seems. Some would more than likely consider it a sickness. A mental disorder. An obsession. Perhaps they are right to a certain extent. It doesn't rule my life or consume my every thought, but it is there none the less. What I can tell you is this; due to the personal experiences I have had, the things I have witnessed with my own two eyes, I take the subject very seriously, and I am extremely passionate about it. That is why I am choosing to clear the air about some of the recent events that have taken place. The Bigfoot community has become divided a great deal in regards to this project. I have seen arguments from both sides, and I have been more than willing to add my own two cents into the fray. Recently I saw a Facebook post where some random person I've honestly never heard of made the comment that they feel a lot of people will be back peddling once it is concluded (in their opinion) that Dr. Ketchum's results are found to be true and accepted by the scientific community. The question has been posed by Ketchum's followers many times, what if the results are true. 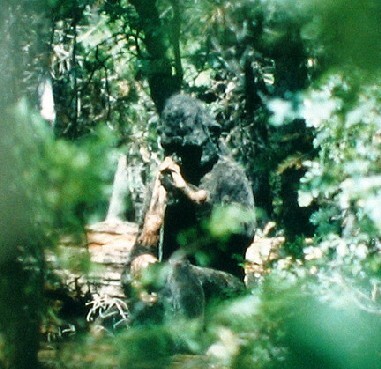 If Sasquatch are a hybrid species of modern man and some unknown, so be it. I can accept that. I have no issues with Bigfoot being whatever it is. That has never been an issue as far as I'm concerned. The issue(s) as I see it is the way the study has been conducted and presented. Science has no room for cloak and dagger behind the curtain secrecy. There have been numerous inconsistencies, if not flat out lies, obvious signs of an agenda being pushed, and now what seems to be profiteering taking place. NDA's, copyrights for book and film deals, viewing fees, teaser clips of videos, business contracts, financial partnerships, I fail to see how these are normal and acceptable parts of a non-biased scientific inquiry. I had a phone conversation with Dr. Ketchum many months prior to her information release. At that time she requested that I send her any photos and videos I had, as well as previous results from hair analysis some colleagues of mine had done years before. She claimed that the delay in her results being released was due to two things; the fact that they were going to be published in a major newsstand magazine, and they were wanting photo and video stills to go along with the article, and that she had created a business entity with a partner that was connected to Tom Biscardi, in which she was trying to legally remove herself from so they would not have any rights to the profit that was going to be made from book and movie sales once the paper was released. She told me that the paper itself had undergone several rewrites, and that the peer review of her work had already been completed. According to Ketchum the results were that Bigfoot were a type of human. I had no NDA with her, but I did give her my word that I would not say anything, which I kept. I did not question her about her study, in fact the intent of the phone conversation had nothing to do with her work, which I explained to her at the beginning of the call. She willingly and openly gave me all of this information on her own. Another set of circumstances surrounding the study that I find problematic is the motivation of an agenda. It is by no coincidence that Melba has aligned herself primarily with the habituator camp. She claims to have entered this study as a skeptic, but according to her own words during our phone conversation, she was far from what one would consider skeptical. She claimed that part of the reward of having done this study was the "I told you so's" to some of her own peers and colleagues. She told me stories of how Bigfoot would visit her horse ranch and braid their manes and tails. The most telling of all the things she told me was that Bigfoot had been psychically communicating with others, and that they (Bigfoot) had chosen her to do this study and prove their existence to the world so that she could lead the campaign in protecting them. Does that sound skeptical? Does that sound like a person you would want to lead a scientific inquiry? Of course Dr. Ketchum could easily deny all of this. I have no way of proving the conversation ever took place, and regardless there would still be those who would blindly follow her because they want the results to be true. They want to be vindicated in their personal beliefs of what Bigfoot is or isn't. If the science was conducted properly, and the results are on the up and up, I have no problem with it. I won't be back peddling or eating crow. I will still stand firm in my beliefs that things were handled and presented the wrong way, and until this data is checked and the results are repeated by TRUE NON-BIASED SCIENTIFIC entities, I will remain skeptical of the results. Like the Ketchum DNA study, the "Matilda" footage is part of a bigger picture. The Erickson Project. The Erickson Project has been ongoing for many years now. The point of the project being the final proof of the existence of Sasquatch. Erickson has made many claims of having DNA samples, audio, and close-up video of these creatures. The Ketchum DNA study obviously plays a major role in this, as it was one of Erickson's samples that allowed for a full genome sequence in the study. Erickson also provided major funding to Melba's DNA study. "Through the years the Erickson Project has collected and funded testing of a number of Sasquatch DNA samples from various geographical areas of North America at a variety of DNA labs in Canada and the United States. Even though the results of those mitochondrial tests all came back human, namely 'Eastern European' Adrian Erickson and Dennis Pfohl were convinced that the samples were from Sasquatch and not 'contaminated' by humans. When yet another scientist related to Erickson that a different sample tested at the University of New York (one of the labs the Erickson Project had also used) also came back as 'Eastern European' the scientist dismissed it as human. At that point however, Erickson knew he was on the right track and needed to test further. He contacted and started to collaborate with Dr. Ketchum and provided her with his samples and the previous DNA results in order to continue testing. As the study expanded Erickson supplied much of the initial funding of Dr. Ketchum's study which was more in-depth and involved nuclear DNA. This study was completed after five years. The Erickson Project is a contributor of six Sasquatch DNA samples to Dr.Ketchum's study, all from diverse areas, one of those samples was used to sequence a complete Sasquatch genome in Dr. Ketchum's study. Specific information on the role of The Erickson Project will be released when her manuscript is published; this will be posted on this website." Notice anything that might be taken as a conflict of interest? Such as funding a DNA study that produces results that supports your own theory? Erickson is a business man. A business man that has spent a lot of his own money on this project to make it happen. And I assure you, Erickson intends on making some of this money back, if not turning a profit. DNA results do not make money. Well in this case I guess they make $30 a read, but still. Movies and books make money, and it is the general public that purchases those items. DNA results don't quite do it for the general public. The vast majority of us don't understand the jargon to begin with. What does sell those items is video footage. People tune in to "Finding Bigfoot" every week to see if they captured anything on video. People want to see a Bigfoot. I have not seen the entire Matilda footage. Therefore I can not say one way or another what it is or isn't. What I can say is this; the brief, looped clip that I have seen does not in any way shape or form look like anything I have seen that I consider a Bigfoot. It does not have the physical attributes that I have personally seen. And as far as I can tell, it has not been shown in it's entirety to a neutral party that would know what a Bigfoot looks like. Here are the problems I have so far. Bigfoot has hair, not fake looking fur. The coat is not laying in a natural way. Bigfoot are not entirely covered in thick hair. Skin is at least partially visible on various areas of the body. Bigfoot are muscular, and those muscle patterns can clearly be seen beneath the hair. I look forward to seeing the "Matilda" footage uncut, as well as any other video or audio that Erickson has collected over the years. Hopefully it will be soon, and won't cost me anything. Yeah, right. Just keep in mind, Erickson has money, and with money you can make a lot of things happen. Things that normal individuals can't. Such as having movie quality costumes made. I'm not claiming this is the case with "Matilda". I just think it is the best possibility. I do not wish failure upon the Erickson project. I do not know the man personally. I hope Bigfoot is proven to be real to the rest of the world. It would be a great relief to me as well as many others who have faced ridicule time and time again over the subject. I also do not think it is impossible to get clear video of these creatures. I think with the right resources and the right amount of luck it can be done. I just don't think Erickson has done it, at least not with "Matilda". Rick Dyer is no closer to having a Bigfoot body now than he was in Georgia. He lied then and I believe he's lying now. He has provided absolutely no proof of having one. The film crew he said was on site was not with him. They were filming Tom Biscardi, not Rick Dyer. They never filmed in or around San Antonio. They have listed the sites they filmed, San Antonio is not on the list, and they never acquired a filming permit from San Antonio or anywhere near it. The creature shown in the tent video is an obvious costume. Anyone who has laid eyes on a Bigfoot can tell you this. Nothing in his story adds up. There is no factual evidence supporting any of his claims. But there is however plenty of factual evidence showing that he is lying. It is not some sort of major accomplishment to fool people that have no clue as to what these things look like, how they behave, or have any more knowledge on the subject than what they have read on Facebook. Yet one group who claims to be experts in the field, awarded him the Researcher of the Year award. What exactly has Rick Dyer contributed to the field other than one famous hoax, a fake video, and an outrageous claim that has no evidence to support it? I guess we should give the Bigfoot Lifetime Achievement award to Ivan Marx while we're at it. I'm sure the fine folks at FBFB would give their "expert" opinions that all of his films were authentic as well. Hello, I'd like to reproduce this entire article if I may. I am frankly getting tired of a lot of this stuff and I'd like to Clear the Air on the topic myself.